Nov. 20, 2013 — Every year, private companies extract billions of dollars worth of oil and gas from federal land in states around the country. In return for their access to public land, those companies pay royalties to the federal government and the government of the state where the oil and gas is produced. FOR OIL AND GAS COMPANIES? Royalty payments are not the only revenue source associated with producing oil and gas on public lands. Private companies also have to pay to lease the land in the first place. New leases are sold through a competitive bidding process, but the minimum amount a company must bid is only $2 per acre. If a company has leased federal land but is not currently producing anything on it (and thus not paying any royalties), that company is required to pay an annual rental fee on its lease. Rental rates are only $1.50 per acre during the first five years of the lease and $2 per acre in each year afterwards (most oil and gas leases are 10 years in duration). Though we have not analyzed lease sales or rental payments for the purposes of these visualizations, many experts agree that significant revenues might be derived from increasing these statutory rates. The current royalty rate for onshore oil and gas produced on federally owned land is 12.5 percent. Despite increasing need for federal and state revenue, this rate has not changed since 1920 (the royalty rate for oil and gas produced on federally-owned offshore land was increased in 2007 from 12.5 percent to 16.67 percent and then again in 2008 from 16.67 percent to 18.75 percent). Many states have set higher royalty rates for oil and gas produced on state-owned land. For example, according to the Center for Western Priorities, a research group based in Denver, the royalty rate for oil and gas produced on state-owned land in Colorado, Montana, Utah, and Wyoming is 16.67 percent. In North Dakota and New Mexico, it is 18.75 percent, and in Texas, it is 25 percent. In other words, if you have rights to drill on federal land in Texas, you only pay, at any level of production, half the royalties you would pay for drilling on state land. So how much money is actually at stake in connection with onshore production? 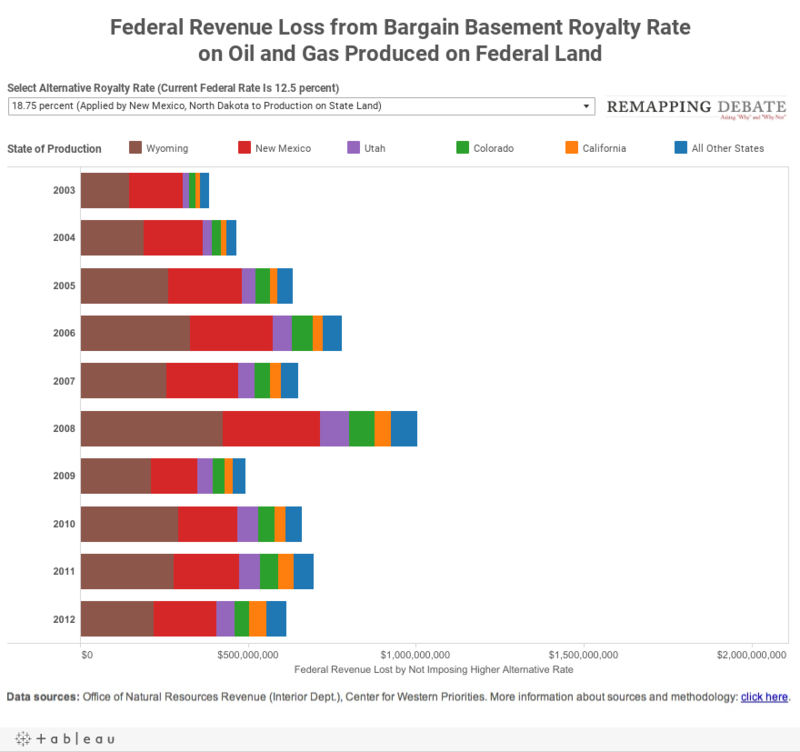 Remapping Debate’s two new interactive tools allow you to select alternative royalty rates that some states apply to production on state land and see the revenue that has been lost in the period from 2003 to 2012. Current law distributes 51 percent of royalty revenue from production on federal land to the federal government, and 49 percent to the state in which the federal land is located. The first visualization presents the revenue lost to the federal government. Select an alternative royalty rate: the 16.67 percent that Colorado and Montana apply to production on state land, the 18.75 percent that New Mexico and North Dakota apply to production on state land, or the 25.00 percent that Texas applies to production on state land. Note that nearly 80 percent of the federal government’s share of royalty revenue is dedicated to the Bureau of Reclamation, which undertakes projects that directly benefit many Western states. For more information about data sources and methodology, click here. Go to the next page to see a visualization of revenue lost to each state.